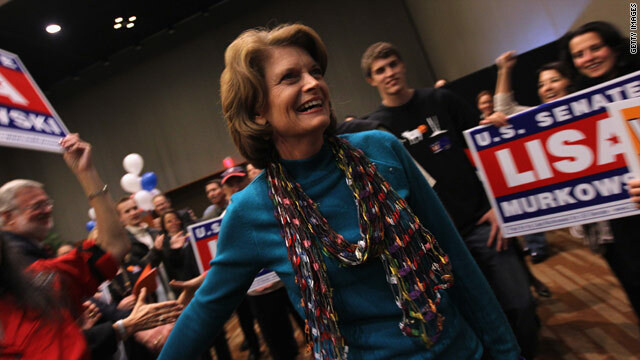 Sen. Lisa Murkowski thanks supporters Tuesday in Anchorage. It's unclear if she will be heading back to Washington next year. (CNN) -- An unyielding and exuberant Sen. Lisa Murkowski thanked her supporters on election night as she appeared headed to a once-improbable victory in Alaska's Senate contest. Just two months ago, the incumbent Republican conceded her party's primary to little-known Tea Party-backed Joe Miller. Shortly after, Murkowski dove into the middle of Republican infighting by launching a write-in bid to retain her seat. Party leaders criticized her decision. Former Alaska Gov. Sarah Palin, who endorsed Miller, called Murkowski's revived campaign "a futile effort on her part." The last U.S. senator to win on a write-in campaign was Strom Thurmond in 1954. "They said it couldn't be done," Murkowski told CNN as the results came in late Tuesday. "We looked at that, and we said if it can be done anywhere, it can be done in Alaska, and let's prove the rest of the country wrong." Aware of the intricacies of a write-in win, Murkowski cautioned that "we're not done yet. There's still a lot out more there; we know that." The votes for write-in candidates outnumbered those for both Miller and Scott McAdams, the Democratic candidate. But the outcome of the general election might not be known for days because officials need to determine which write-in votes actually went to Murkowski. She was one of 161 people who filed the paperwork necessary to qualify as a write-in candidate, according to the Alaska Division of Elections. As of Wednesday night, with 78 percent of precincts reporting, the write-in candidates were leading the pack with 41 percent of the vote. Miller had 34 percent, and McAdams trailed with 24 percent. CNN has projected that the Democratic candidate will finish in third place but has not yet called the race for Murkowski or Miller. Despite Murkowski's excitement, Miller's campaign remained optimistic Wednesday, saying, "This campaign is not over!" "Previous write-in campaigns in Alaska have demonstrated that as much as 5 [percent] to 6 percent of returned ballots have not met the standard to be counted as a valid vote," the campaign said in a statement. "Candidates who mount a write-in campaign opt for an uphill battle. At this point, without a single write-in ballot counted, Lisa Murkowski has no claim on a victory." Another fellow Alaskan running as a write-in is Lisa M. Lackey, whose presence on the ballot may complicate things for Murkowski. Under state law, for a write-in vote to be valid, the name written on the ballot must match the name as it is listed on the write-in candidate's declaration of candidacy. In Murkowski's case, the law requires her supporters to write "Lisa Murkowski" or "Murkowski" for the vote to be counted. However, in the event a voter misspells or abbreviates a candidate's name, such as "Lisa M." instead of "Lisa Murkowski," the Division of Elections would determine the voter's intent "on a case-by-case basis," according to division director Gail Fenumiai. With two potential "Lisa M's" as write-in candidates, determining the intent of a voter who writes in "Lisa M." on his or her ballot would be much more difficult. Matt Felling, an anchor for KTVA-TV in Anchorage, said the race could prove to be the "highest stakes spelling bee in American political history." "Now we are going to find out how many people can put nine letters together that somewhat resemble Murkowski," he told CNN. Miller's campaign blasted the Division of Elections' standards as "extraordinarily ambiguous." On election nights, the Division of Elections tabulates the total number of write-in votes cast -- not a breakdown by candidate. The Division of Elections only calculates the number of write-in votes for specific candidates if the total number of write-in votes cast is more than the number of votes received for any candidate, or if the total number of write-in votes comes in a close second to the top vote-getter. Before the Division of Elections can start tabulating the write-in votes for specific candidates, all of the ballots cast have to be counted, including absentee ballots, early votes and questioned ballots. The lieutenant governor's office and the Division of Elections plan to count all absentee ballots next Tuesday and move on to the hand count of the write-in votes the following day. The count of the write-in ballots is expected to take about three days. The count was moved up from the original date of November 18 to provide election results in "a timely manner," according to Renee Limoge, spokeswoman for Alaska Lt. Gov. Craig Campbell. Miller told CNN he would challenge the decision to count the votes earlier than planned. He also said that as of Wednesday, he had not heard from the national GOP, which backed his candidacy. Murkowski said she intends to caucus with the Republicans should she return to the Senate. "I'm not my party's nominee, but I am a Republican," she said. With a victory, Murkowski would avenge her August primary loss to Miller in the latest chapter of a feud with his main backers and her long-standing tension with Palin. Murkowski was first appointed to her post by her father, then-Gov. Frank Murkowski in 2002. Palin defeated him in the 2006 GOP gubernatorial primary. CNN's Drew Griffin, Jason Hanna and Robert Yoon contributed to this report.